A visit to at least one school had been on my Gaza wish list. My fixer, Rami, as ever, had it all in hand. He picked me up at 7.30am. “Why so early?” I asked. “Because the children start school at 6am.” I’m led to believe it’s all down to electricity. Nevertheless, I tried to imagine my mother getting a 10-year-old me out the door for school at 5.30am. Not a chance. We entered the school and first met the teachers, all female of course. They were kind and welcoming, as I was beginning to realise, near everyone in Gaza was. Schools in Gaza are segregated by Hamas for religious/ideological reasons. Girls and boys don’t mix. We entered a packed classroom of 36 girls aged 13 or 14. Learning English from a young age, they bombarded me with questions about Scotland. Soon, though, they began to tell me about their lives in Gaza. One girl read a poem in English, another sang a song in English, while one wept as she told about losing her uncle, who was killed by an Israeli strike in 2014. She was struggling, yet wiped away her tears and ploughed on with her story. Her teacher hugged her and we all applauded quietly to acknowledge her bravery. I had not expected this level of passion, emotion and maturity. What also impressed me was that there was no hatred. These schools do not teach their children to hate Jews or even the state of Israel. That said, the children are genuinely upset about the life they have to live and they don’t understand why it has to be the way it is. Gaza has been blockaded from the outside world for more than a decade, therefore these girls have known nothing else. They live in the Gaza Strip and have never seen past its walls. Tell your child or grandchild about this and ask them how they would feel if they weren’t allowed to ever leave a strip of land 25 miles long and, at its narrowest, only three miles wide. I’m usually more than happy to discuss my travels with anyone who takes an interest. But I actually felt embarrassed when the girls asked me where I had been. When Rami told them I had been to more than 80 countries and could come and go almost anywhere anytime I wanted, I saw the look of awe on their faces. There was excitement as they asked me about the world, but also a hint of sadness in their eyes as they knew that what I was describing was impossible for them to experience. When I asked the girls what they wanted to do when they grew up, I was intrigued to hear the answers. Ask a 14-year-old back home and these days you’ll probably hear at least a few say “I want to be a singer, I want to be famous”. These girls, remember they are in Gaza, and they can’t leave, so if they said to me “I simply just want to get out of here” I would not have blamed them one bit, said no such thing. The answers I got were, “I want to be a teacher, a lawyer, a doctor, a journalist”. I was deeply impressed. These girls are clever, no doubt about that. The photos you see here are of children aged around 10 to 12. I was not told it was not allowed to photograph the older ones. 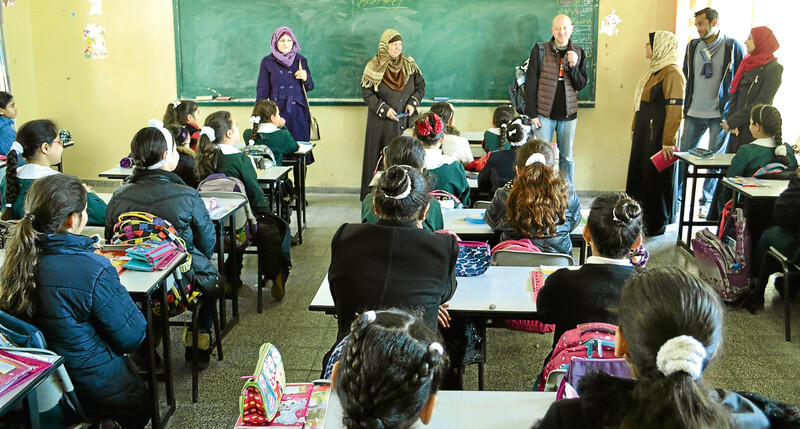 After a quick taxi drive through the crowded, polluted streets of Gaza City, we arrived at the next school. Again, this was a girls only school, from ages six to 12. Interesting to note that when I asked the teachers about the school set-up, they told me that when they themselves were children, schools were mixed. They’ve only been segregated since Hamas came to power in 2007. I visited five classrooms in the second school. Being younger, the children were, in general, a bit shy at first, but once they found their tongues, there was no stopping them, and of course they asked their numerous questions in English. We laughed, we joked, it was beneficial for us both I think. I kept glancing at the teachers, they seemed pleased. Then, it was time for them to tell me about their lives. Many of them told me that they loved their teachers. This wasn’t just words for my benefit, the children genuinely loved their teachers, and their teachers them. Think about it, you come from a poor home somewhere in Gaza, maybe inside a refugee camp, it’s possibly cold, your dad is out of work, many children told me that their family had little money, and they all, of course, had precious little electricity. So coming to school ain’t such a bad idea after all. It’s warm, there is electricity due to the school generator, you see your friends, the teachers teach you interesting things and are kind. No wonder these children love their school. All of them mentioned what they call the “siege of Gaza”. And by far, the number one thing every child wanted to talk about was electricity, or the lack of it. As I’ve explained previously, the electricity in Gaza comes on for maybe only four hours per day. They told me about how they read books at night with the aid of torches. While in Gaza, I also heard a horror story regarding candles. Long tragic story very short, as it’s far too depressing to really go into. The candles, lit by the parents so the children could read, got knocked over setting fire to the bedroom. Their children died. I felt very humbled meeting these children and hearing their stories. I plan to return to Gaza later in the year. I will return to these schools and spend quality time there. I want to learn much more about life in Gaza from the children’s perspective. I promise to write much more in depth about this when the time comes. Do the armed, masked men of Gaza, those who declare Jihad on Israel, do they have these children’s best interests at heart? Do they really believe that every time they send a rocket into Israel that these children or teachers approve of such actions? Or do the teachers and children worry about the inevitable retaliation? Does Israel, which rightly defends itself against indiscriminate attacks, yet whose own rockets have cost the lives of innocents, does Israel have these children’s best interests at heart? I can’t get the horrible phrase “collateral damage” out of my mind when thinking of both sides’ actions. I’m about to ask for your help here. The schools I visited in Gaza are desperate to connect with a school in the UK. These kids can’t leave Gaza, so I’m not talking about foreign exchanges or money donations, I’m simply looking for an introduction. The Gaza schools have access to Skype and e-mail, so contact can be made via the internet. Projects could be worked on together, stories shared and friendships made. Can you imagine what a learning curve it would be for Scottish children to hear stories from children their own age about living without electricity? If anyone reading this column is involved with schools, or knows of anyone who is, then please get in touch with me via the P&J, and let me know if you can help. The children and teachers simply want to communicate with the outside world. The children in Gaza think that the outside world does not care about them. Come on, there must be somebody reading this column with a good connection in education? It was hard for me to leave, but after a heap of photographs with lots of smiling faces, we simply had to go. Time to move on to my next set of interviews which Rami had already lined up. Fishing in polluted water is bad enough. Being allowed to fish only within a six nautical mile zone is also very restricting regarding what you can catch. Could it get any worse for the fishermen of Gaza? Yes, it could, for if your boat strays close to the limit line, you stand the risk of being shot at by the Israeli Navy.